I borrowed this recipe printed on the can of Libby’s pumpkin pie filling but made some modifications and utilized my own variation. Pre-made canned pumpkin fillings are a scarcity where I live so I made a pumpkin puree from scratch. I honestly never cared for pumpkin. I never had a reason to eat it other than on Thanksgiving.I would eat it if it were placed in front of me. I was more partial towards pumpkin seeds in which I would sometimes season and roast just to have something to snack on. 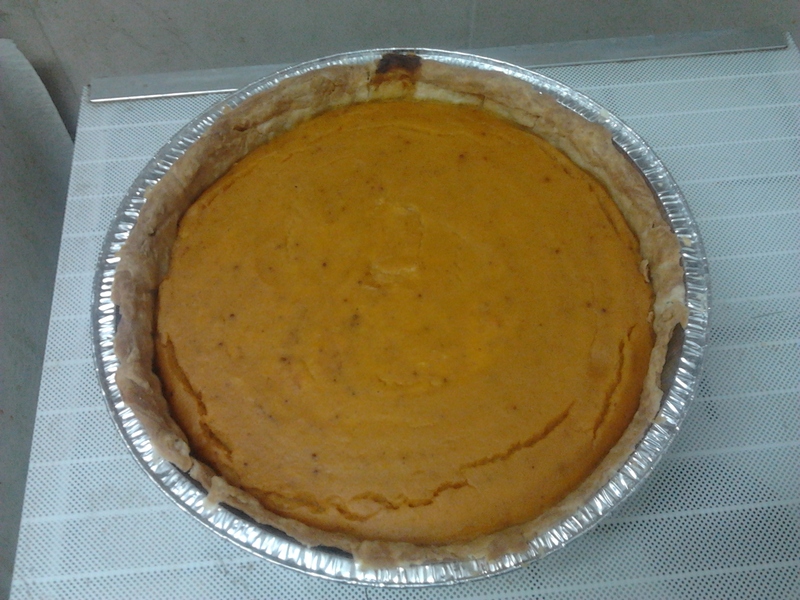 I decided to make pumpkin pie as means to divert from sweet potatoes. The cinnamon and the grounded cloves enhance the flavor. Rather than using heavy cream, I used soy milk. You can use non fat or reduced fat milk too as a way to reduce the fat content in this pie.. I didn’t make this pie exclusively with pumpkin as noted. I also incorporated some sweet potatoes as well. You can go in any directions and make this an exclusive sweet potato or pumpkin pie. You can use other types of squash puree as well. If you want to save time and take a shortcut, you can definitely opt for the canned puree. Just skip over the process of making pumpkin/sweet potato puree. This pie can be served as a side dish or as a dessert dolloped with whip cream on top. Some people like to add roasted pecans but I didn’t. Each to his/her own. For the puree, place chopped pumpkin and sweet potatoes in a pot. Fill water half way. Bring to a boil on medium low flame and cook covered. Make sure pumpkins don’t burn. Remove lid and continue cooking till soft. Drain most of the water but leave some. Using a hand blender or a food processor, puree mixture till smooth. Set aside. In a bowl, mix sugar, cinnamon, salt, and cloves in small bowl. Beat eggs in large bowl. 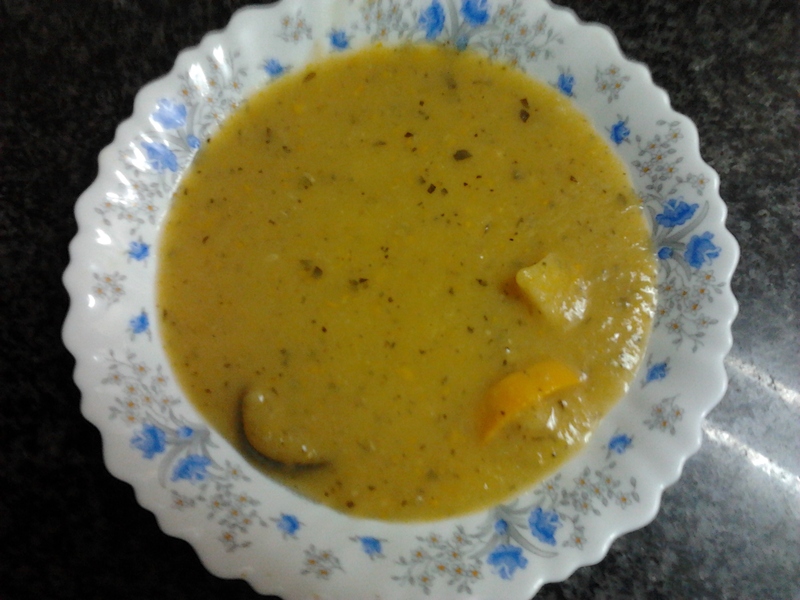 Stir in pumpkin/sweet potato puree. Gradually stir in soy milk. Pour into pie shell. Bake in in preheated 425° F oven for 15 minutes. Reduce temperature to 350° F; bake for 40 to 50 minutes or until knife inserted near center comes out clean. Cool on wire rack for 2 hours. Serve immediately or refrigerate. This entry was posted in Desserts, Side Dishes, Vegetarian and tagged cinnamon, Desserts, eggs, grounded cloves, pastry four, pumpkin, pumpkin spice, Side Dishes, sweet potato, Thanksgiving, vegetarian. Baking bread from scratch can be a time consuming process. But once you’ve mastered the technique and confidence, you can take your baking skills to the next level. While the process to baking bread and roll are similar as you use the same ingredients, baking dinner rolls doesn’t require a lot of time nor effort. As most people do, I prefer homemade rolls. They are fresher, healthier, and tastier in contrast to the rolls sold in bags at bakeries. Dinner rolls are akin to biscuits that have a buttery rich flavor. While they are rustic and crunchy on the outside, they are soft and doughy on the inside. They can be eaten as they are or used as buns or to make sandwiches. Dinner rolls can be made in many variations. You can use whole wheat, whole grain or spelt flour. You can use sourdough as well. You can either make them sweet or savory, or both. 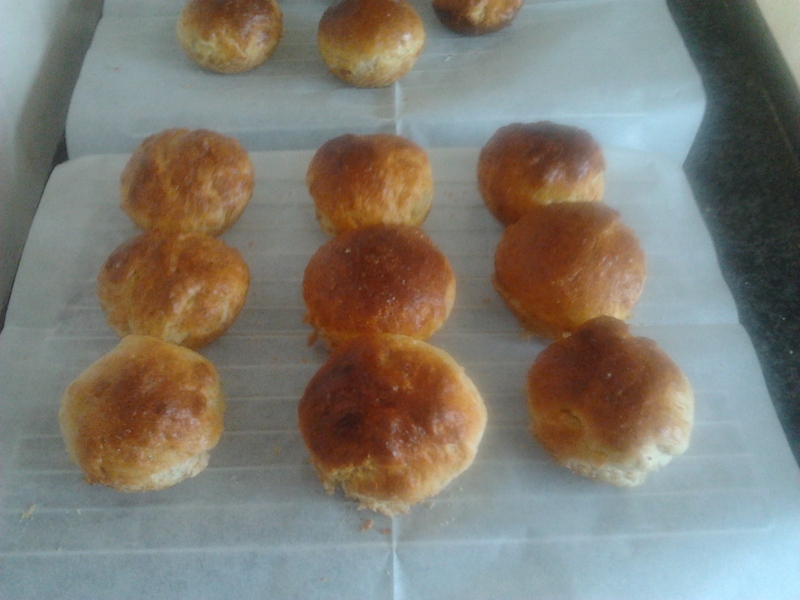 I used an egg to create a coat for these buns in order to give them a shiny and polished look. If you are vegan, you can skip the egg wash and use something else instead. While these dinner rolls are dairy, you can substitute milk for non-dairy milk. Leftovers can be sealed in a zip lock bag and put away for a couple of days. Serve them hot along side a bowl of piping hot soup. In a standing mixing bowl with dough hook, dissolve yeast in warm water. Let sit until lightly foamy, then stir in sugar and add egg, salt, warm milk, and melted butter. Slowly add 5 cups flour, adding more as needed to make an elastic dough. Mix well, then roll out to floured surface and knead dough for about 5 minutes. Place dough in buttered bowl, cover with towel, and set in a warm place to rise until double in bulk, about 1 hour. Lightly oil the muffin pan. Punch down dough and form dough into 1-inch balls. Place 3 balls in each muffin tin. Fill muffin pan, cover with towel, and allow to rise an additional 1/2 hour. Preheat oven to 400 degrees F. Brush with beaten egg . Bake in preheated oven for 10 to 15 minutes or until golden brown. This entry was posted in Bread, Dairy and tagged biscuits, Bread, dinner rolls, egg, Flour, vegan, water, yeast. Saute onion in a an oiled soup pot over medium-high flame until translucent. Add garlic and saute for another minute or 2. Add potatoes and squashes and saute till soft. Season with herbs.Pour in broth and reduce flame to medium-low. Cook for 25-30 minutes. Using a hand blender or a standing blender, puree vegetables till smooth. Leave some chunks. Season with salt and pepper and serve. This entry was posted in Gluten Free, Soup, Vegetarian and tagged challah maidel, Gluten-Free, onions, potatoes, soup, vegetarian, yellow squash, zucchini. I normally enjoy my traditional holiday meal of meat and potatoes. The problem is that I exceeded over my share during the holidays. After all that heavy intake of protein and carbs, I was looking forward to a meatless dinner. Hubby and I mutually agreed to a vegetarian stew. A lot of people cringe over the idea of eating stew without meat/poultry. In fact, the slightest mention of anything vegetarian makes them gag. Not me though. I can appreciate a vegan but hearty meal every now and then. Plus I needed to get back into the routine of incorporating more vegetables in my meals and nothing does it for me but stew. This stew is not only healthy but filling as well. You can eat a bowlful like I do or you can serve it with grains like rice etc. You can use the leftovers and serve it with pasta or if you really must, you can throw in some pieces of meat,chicken,turkey, or cheese. But I can content with it as its made. I initially wanted to added more vegetables but my stockpot had a limited amount of space.Plus the veggies I used were a bit bulky and I didn’t want to cut them too small less it ends up dissolving into a sauce. If you have more space in your pot, you can afford to use more vegetables. 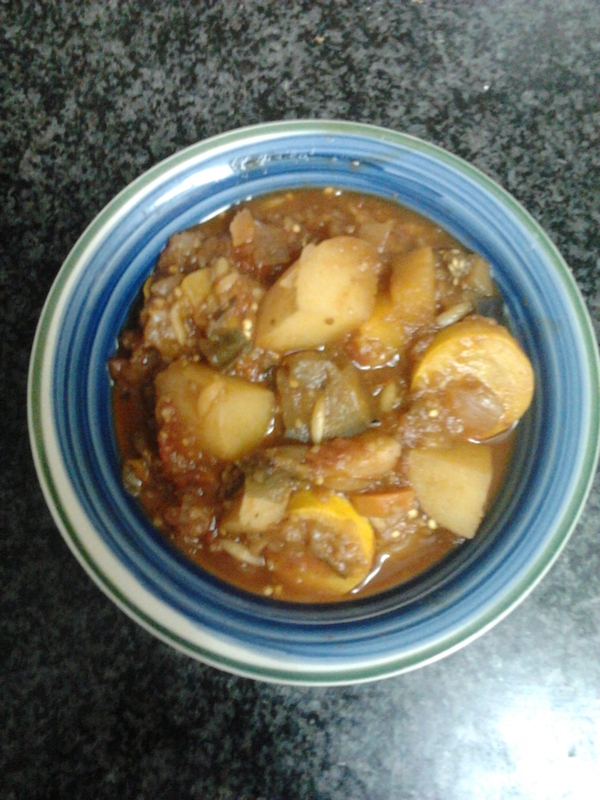 You don’t necessarily have to restrict yourself to the vegetables I used for this stew. You can use any produce of your choice. Leftovers should be stored in a container and refrigerated up till 2 days. Add 2 tablespoons of olive oil to stock pot over medium high heat. Add onions and saute till translucent. Add garlic and saute for 2 minutes. Add the rest of the vegetables, a couple at a time and saute till softened. Season with thyme and rosemary. Pour in crushed tomatoes. Add bay-leaf Stir for another minute or 2. Pour in broth and reduce heat to low. Simmer partially covered for about an hour and a half. Add a little more water if stew begins to dry up and burn. Season with salt and pepper. Discard bay-leaf and serve. This entry was posted in Gluten Free, Vegetarian and tagged carrots, Celery, challah maide, onions, potatoes, squash, vegetable stew, vegetarian. I made this soup at my parents house when my husband and I came to visit in the USA. With only a few ingredients, this easy-to-make soup takes only minutes to prepare. Potatoes gives this soup a creamy and velvety texture without the extra calories and fat. You can use reduced fat milk or sour cream instead if you prefer. I normally like adding in some croutons after the soup is cooked for that extra crunch. You can use pieces of toasted bread or leave it out altogether. Heat oil on medium heat in a soup pot or Dutch oven. Gently sauté onion for 3-4 minutes, until onion is softened. Add garlic and saute for another 2 minutes. Add potato and chopped broccoli, followed by the broth and milk. Bring to a boil, then reduce heat, cover and simmer for 20 minutes, until vegetables are tender.Allow soup to cool slightly, then transfer to a blender in 2-3 batches, and blend until smooth. Season with salt and pepper for flavor. Return soup to pot and heat gently until ready to serve. Top with toasted bread or croutons. 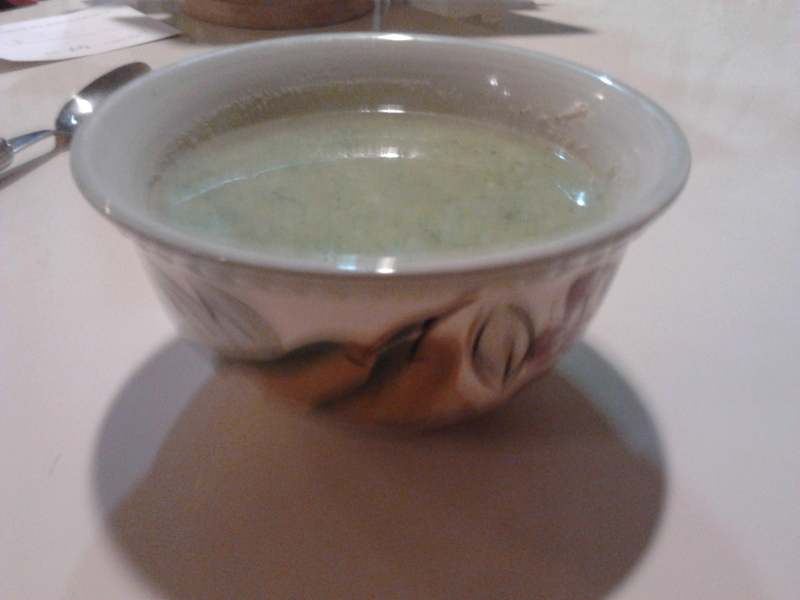 This entry was posted in Gluten Free, Soup, Vegetarian and tagged broccoli, Garlic, onion, soup, vegetarian. This is by far, one of my favorite salads. Most people and kids complain about salads being too boring and lacking of flavor. Every now and then I can appreciate an old fashion garden salad but generally, I’m constantly looking for new techniques. Taco salad can be made in many different variations. The authentic taco salad consists of ground beef. Some like to add chili pepper for spice and a little corn. Others include kidney beans too. To me, salsa is much more convenient. You don’t have to burn your fingers when chopping up a chili or jalapeno pepper. You can make your own salsa from scratch or you can save time and be lazy like me and by the pre-made salsa in a jar. The level of spiciness is entirely up to you. I used the mild version and I ironically like a lot of spice. Others may sprinkle a bit of shredded sharp cheddar cheese on top. My version is simple but feel free to add additional ingredients of your choice! This salad is easy to prepare and it only takes seconds to make. I prefer to use the natural tortilla chips with the least amount of sodium but you can opt for corn chips if nothing else is available. This salad is enjoyed by both adults and children alike. Assemble lettuce and vegetables in a large salad bowl. In a separate small bowl, whisk salsa,ketchup and mayonnaise until well combined. Pour over vegetables and toss lightly. Toss in tortilla chips and serve immediately. 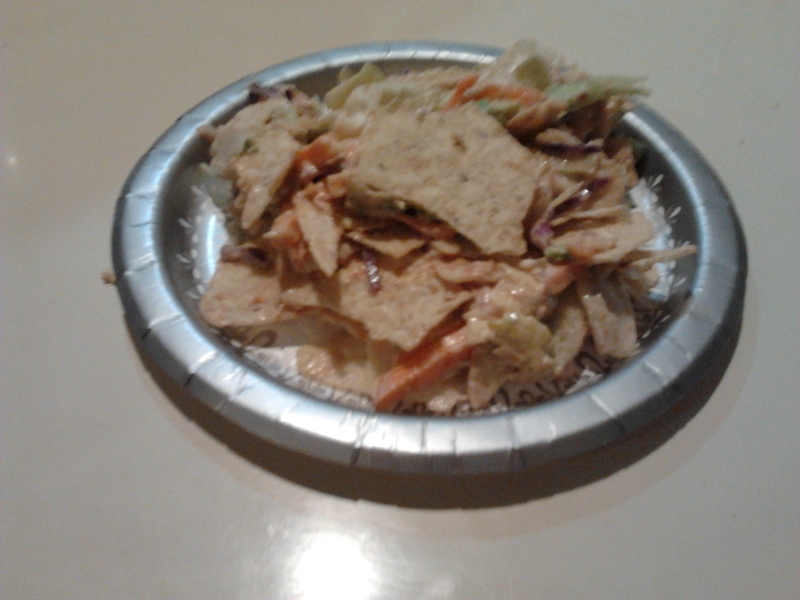 This entry was posted in Salad, Vegetarian and tagged lettuce, Salad, taco, tortilla chips, vegetables. I originally intended to make this into brittle . 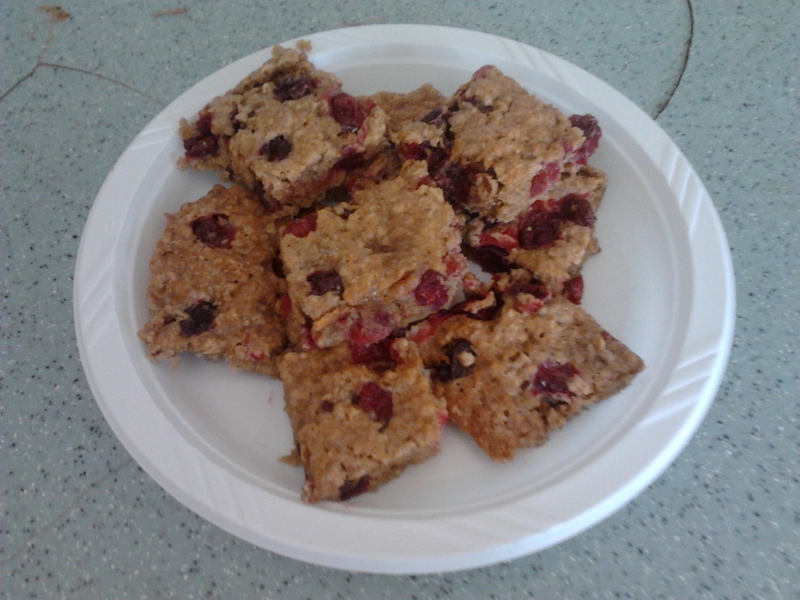 I must have miscalculated the recipe I improvised because it had the taste and texture of a soften oat bar. I used frozen cranberries instead of dried cranberries. Not all is at lost. I particularly enjoy the balance of flavors with the sourness of cranberries and the sweetness of the sugars. The nuts add crunchiness to these bars but you can omit them if you have a nut allergy. All the ingredients are natural and these oat bars make great snacks. Preheat oven to 350 degrees F. In a bowl using an electric mixer, cream margarine till fluffy. Add sugar and mix till smooth. In a separate bowl, combine flours, oats, salt and baking soda till blended. Pour flour mixture into egg mixture and mix till resembles coarse crumbs. Fold in cranberries and almonds. Spread oat mixture evenly over a greased 9x9x2 baking pan. Bake for 30-35 minutes or until the top is golden. Cool in pan on a wire rack. Cut into bars or squares. This entry was posted in Breakfast, Desserts and tagged almonds, breakfast, cranberries, dessert, oats, snack.